Price includes shipping via 1st Class Mail with tracking. Priority Shipping add an additional $3.00. Contact Patti at 443-740-4240 or email Anderson@WildRoseAlpacas.com for adding insurance, or other shipping options or pick up at our farm store. I will ship as economically as I can for you, and will credit you on PayPal for excess shipping charges on multiple items. Maryland residents have 6% sales tax added. 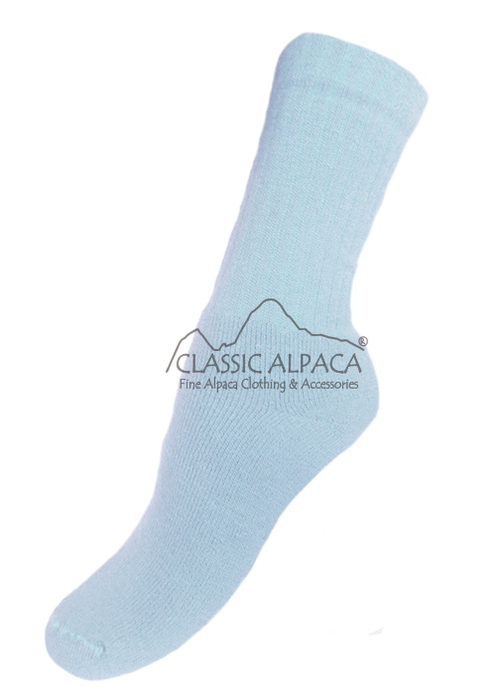 Enjoy the comfort and warmth of this lightweight, finely knitted alpaca sock. It combines the natural thermal properties, warmth, strength and ability to wick away moisture with the comfort of soft alpaca fiber. Fit for a King or Queen! Great for tighter fitting shoes and anyone needing a lighter sock.